OTC DASHBOARD offers users four main ways of analysing the global OTC market; by geographical area (Market Overview), by marketer (Company Watch), by product category (Category Watch) and by product itself (Brand Watch). In this week’s blog, Managing Editor Dave Redford takes a closer look at the latest Q1 2016 data from two of these perspectives to highlight some fresh insights. 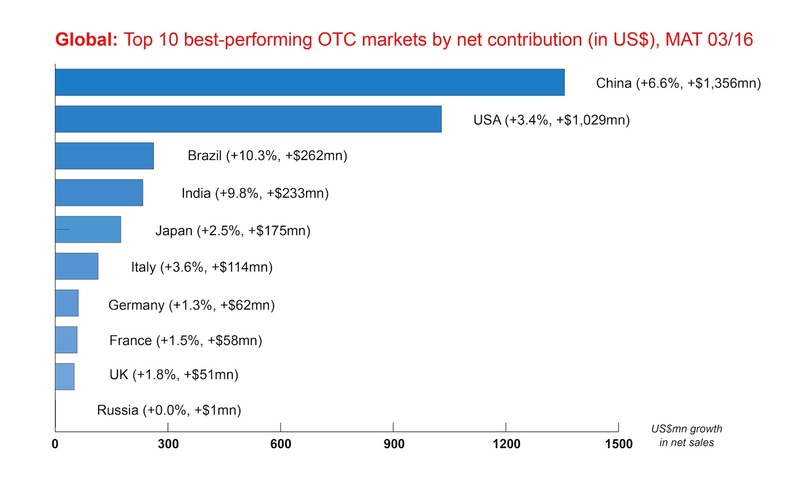 Together, the world’s two largest OTC markets, USA and China, account for 44.6% (US$53.2bn) of the global OTC market (US$119.4bn) by value, and were responsible for a slightly higher proportion of global OTC growth (US$2.3bn out of US$5.1bn, or 46.6%) in the 12 months to end-March 2016. The huge importance of these two markets is out of step with their relative population size, with China (1,372mn people) and USA (321mn people) accounting for a combined share of just 23% of the global population (7,336mn people), according to mid-2015 Population Reference Bureau figures. Despite concerns about China’s slowing economy, it was still the biggest contributor to global OTC growth in the Q1 2016 data, ahead of the USA, Brazil and India, while the other BRIC market (Russia) contributed little more than zero in the 12 months to end-March 2016. Growth was also slower in Europe and North America, owing to the drop-off in cough & cold remedies growth, while Japan showed renewed vitality. As mentioned, cough & cold remedies growth in Europe and North America went from dynamic in early 2015 to flat in Q1 2016. This weakness was mainly linked to the drop-off in flu infection rates in early 2016 (there are indications that the flu season in some countries may have started a little later, in Q2 2016), but also the inherently cyclical nature of cough & cold sales, which have alternated between high growth and consolidation over recent flu seasons. Systemic cold & flu growth was flat or low in Europe (+0.1%), North America (+0.8%) and Asia-Pacific (+2.4%) in Q1 2016, while the more underdeveloped regions of Latin America (+6.7%) and Rest of World (+5.6%) performed better. Unlike systemic cold & flu, allergy remedies (up 10.3% globally) have broken free from any seasonal dependency in recent years thanks to the power of Rx-to-OTC switch, with GSK’s Flonase the latest brand to drive self-medication growth. Despite growing competition for Flonase in the US market from brands (for example, Bayer’s new fluticasone-based ClariSpray) and generics, the outlook for US allergy remedies still looks strong, thanks to new switches like McNeil / J&J’s Rhinocort Allergy Spray (budesonide) and patented indications, such as the three-year exclusivity that GSK has secured for Flonase with its “itchy, watery eye relief” claim. See this month’s OTC INSIGHT North America for a full case study on Flonase. Overall, out of the global OTC market’s six major categories, only one (Lifestyle OTCs) showed improved growth in Q1 2016, while the other five (analgesics, CCA, gastrointestinals, dermatologicals and VMS) all decelerated. Some of the main factors in faster Lifestyle OTCs growth were higher levels of innovation and switch activity, as well as the resumption of supply for brands in key subcategories, like smoking control and obesity treatments. Growth for Lifestyle OTCs is likely to accelerate further in Q2 2016. As the second quarter results for most Pharmaceutical and Consumer Healthcare companies begin to come in, it affords us the perfect time to review how the overall global OTC market is currently standing. 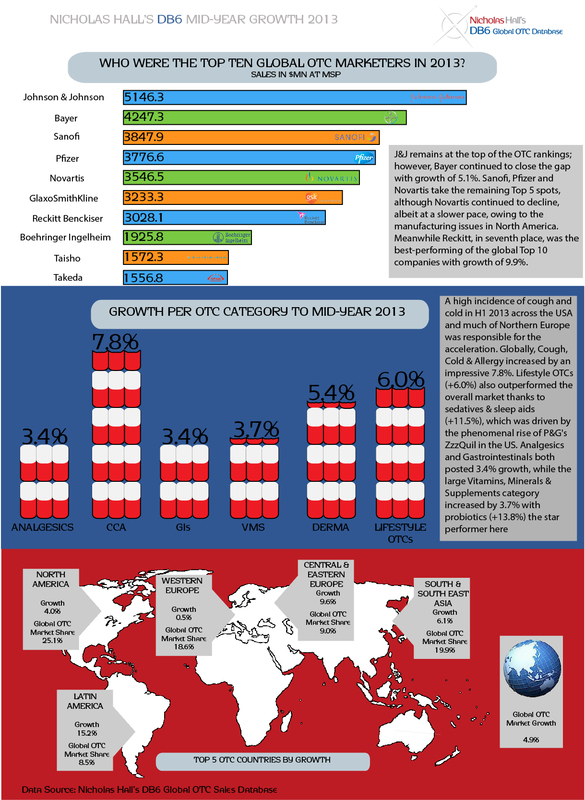 Taking the Mid-Year Sales Data for the global OTC market in the 12 months leading up to June 2013, shows that the market has grown by 4.9%; the highest growth since 2009. BRIC countries continue to perform significantly ahead of the market with Russia and Brazil particularly impressive, although this is partly thanks to prices increases. For more information on the Mid-Year Sales Data, please follow this link to the DB6 Global OTC Database website.